Many years ago, while on vacation in the northeast, our family visited the state of Vermont. Vermont was beautiful in the middle of June, but I had always been told that the most beautiful time of year in Vermont is autumn. Because both my husband and I are teachers, seeing the state at its most picture perfect was not going to happen for me. I voiced this disappointment to Jim, who quickly responded with this…”Don’t worry, someday when we are retired, I promise I will bring you to Vermont in the fall”. 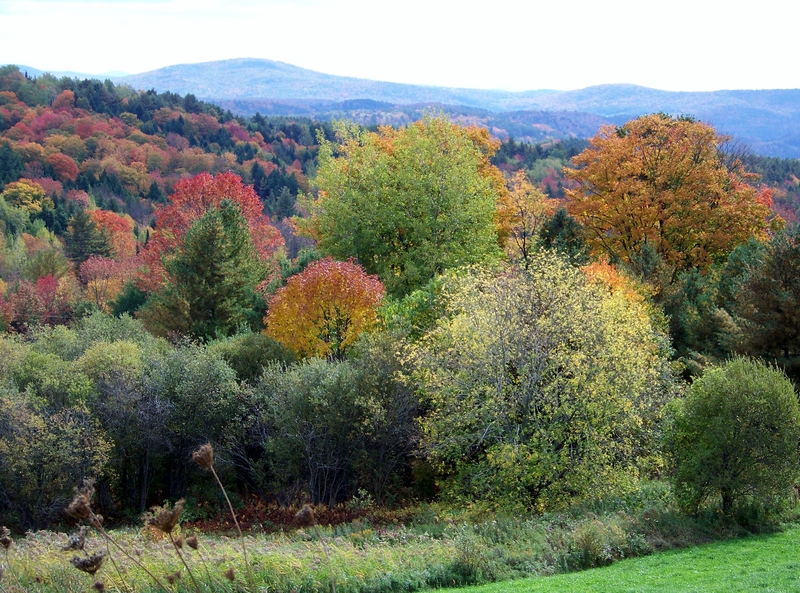 Vermont is indeed a beautiful place to be in the autumn of the year. In the fall of 2010, we headed out to check off this bucket list item. We rented a house near Craftsbury, in the Northern Kingdom, for two weeks. During that time, we were able to drive each day to see another corner of the state, often returning to “our” house to make dinner with the fresh produce we picked up on the way, no matter which direction we went. And that brings me to one of the most amazing things about Vermont…fresh food, available at farm stands everywhere. Our favorite stand, not too far from where we were staying, is called Pete’s Greens. 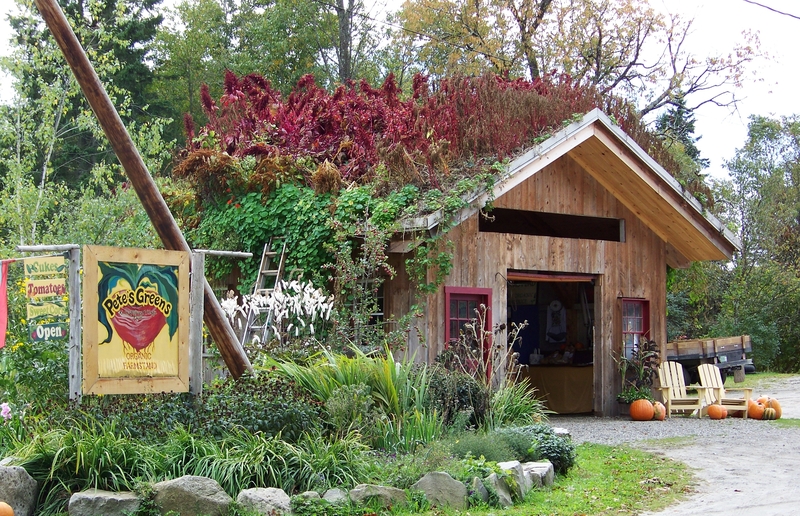 Pete’s Greens is an eclectic farm stand with fresh food for sale each and every day, May through October, from 8 a.m. to 8 p.m. We loved the “living roof”, and still display a picture of it each fall somewhere in our home. You can learn more about Pete’s Greens by visiting their website at http://www.petesgreens.com/where-to-buy/farmstand. Pete’s Greens, on a farm outside the town of Craftsbury. One of our favorite places for breakfast was Sugar and Spice Restaurant in Mendon. They have the very best pumpkin pancakes ever! After an order of these pancakes smothered in good Vermont maple syrup, you may not want to, or need to, eat for the rest of the day! We also visited a maple syrup house where we purchased maple syrup and maple cream. Fresh popovers with maple cream is now one of Jim’s favorite breakfast dishes…with a side of bacon, of course. Sugar and Spice Restaurant in Mendon. 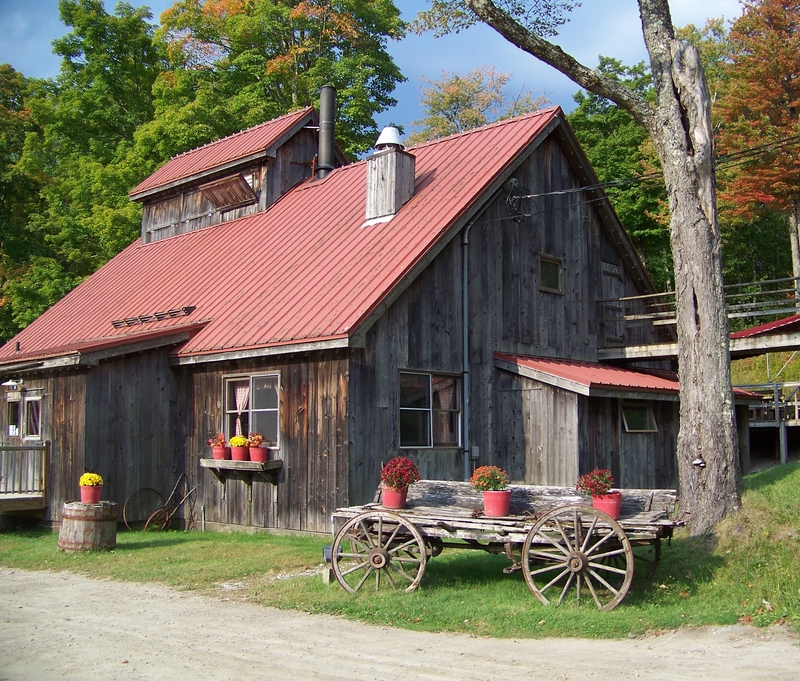 Vermont has many maple sugar houses. 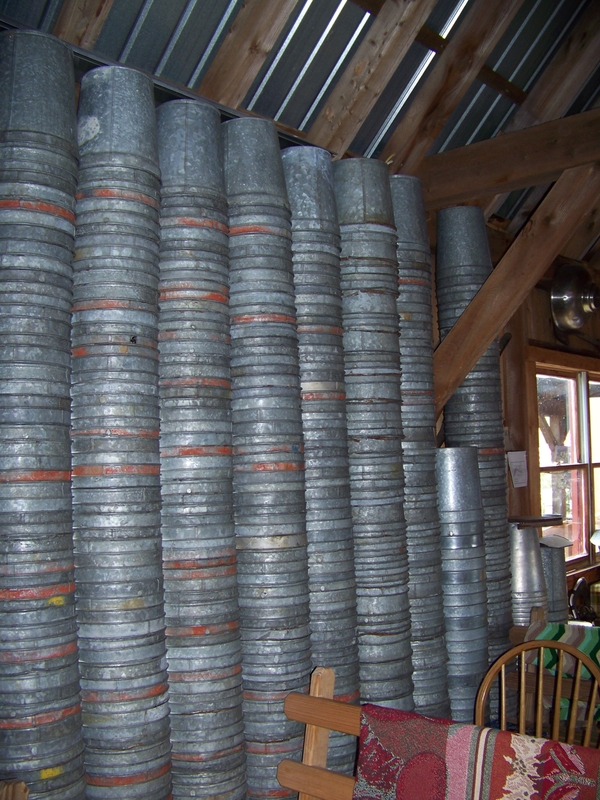 In this sugar house, you can see the hundreds of buckets that are hung each year to collect the sap from the maple trees which are so plentiful in the state. 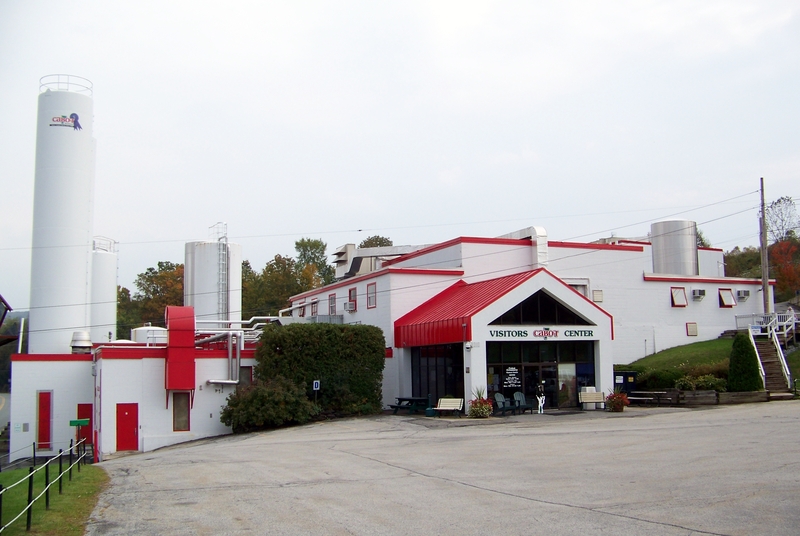 We traveled to Cabot to tour the cheese factory and to load up on lots of the great cheeses made there. We also made a stop at King Arthur Flour Co. I cannot begin to tell you how many great things I found there that had to come home with me! Green Mountain Coffee and Ben and Jerry’s Ice Cream in Waterbury were also on our “foodie” visitors list. 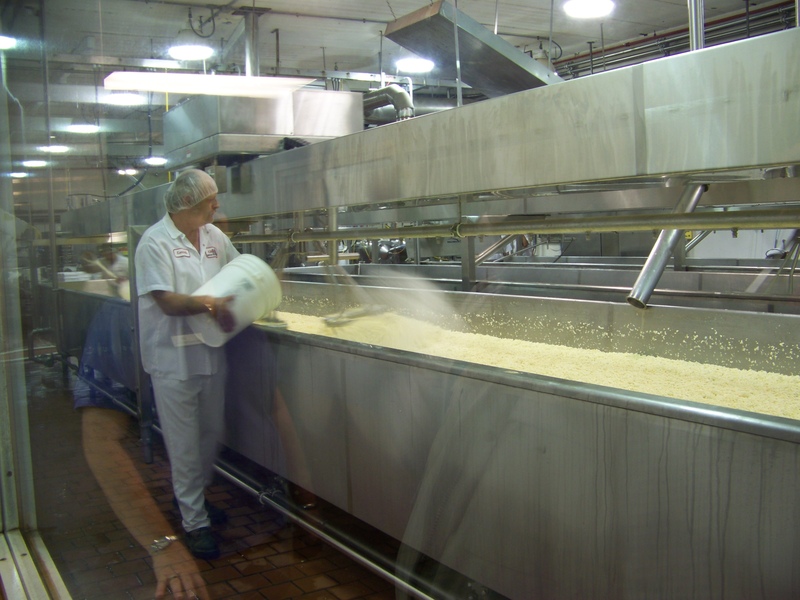 Watching salt being added to the curds at Cabot Cheese. 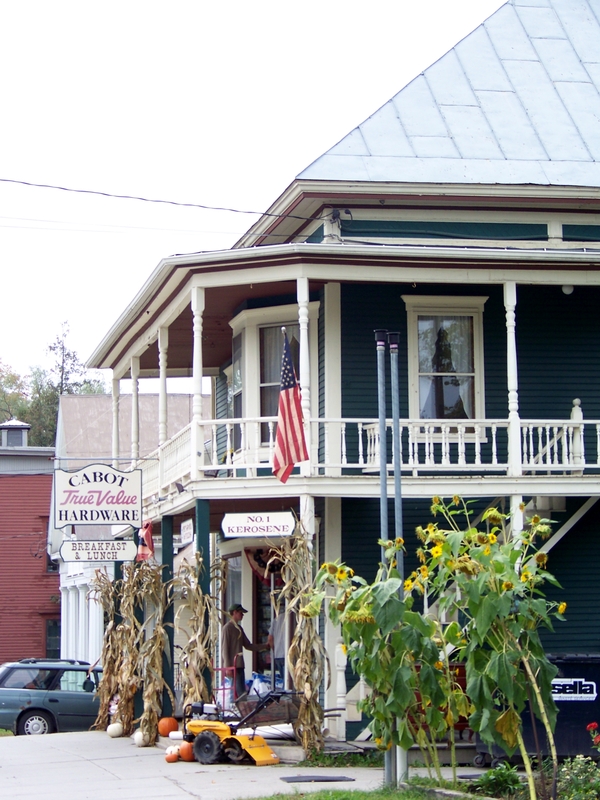 Cabot is a typical Vermont small town. 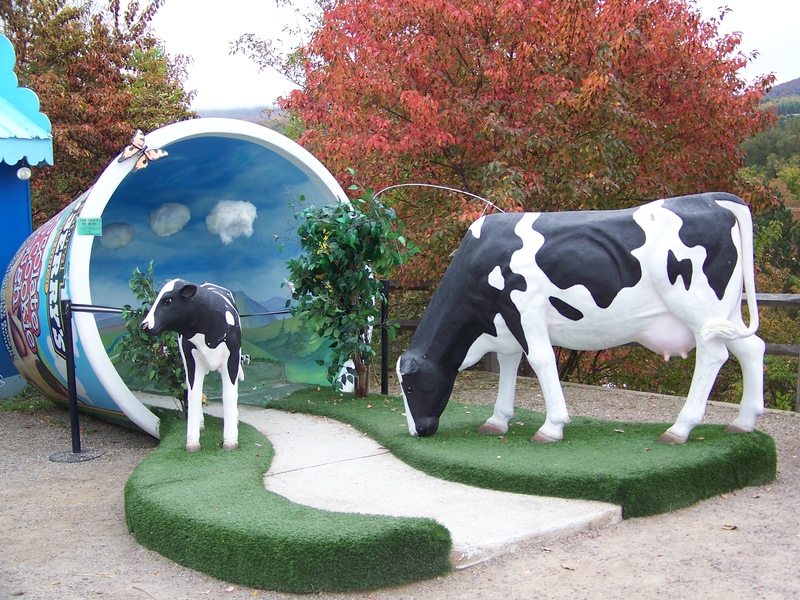 What would a trip to Vermont be without a stop to tour and taste Ben and Jerry’s? 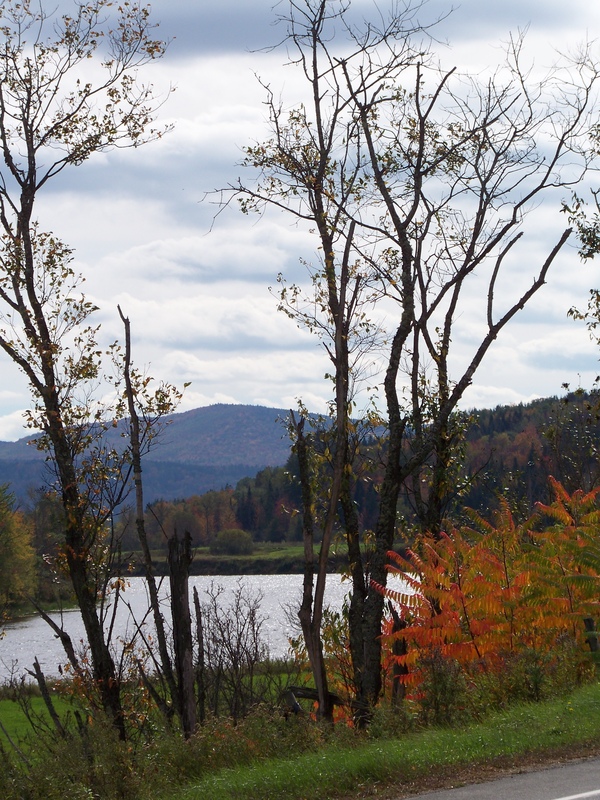 We traveled all around the state, not only eating, but also looking at the breathtaking scenery, hiking trails in the Green Mountains, visiting historical sites, and shopping in the many specialty shops we found. And each night we came back to our house for the quietest nights I have ever experienced…on a country road in the Northern Kingdom. Each and every town has its own town hall or community center. They are all so similar, yet so different and unique. 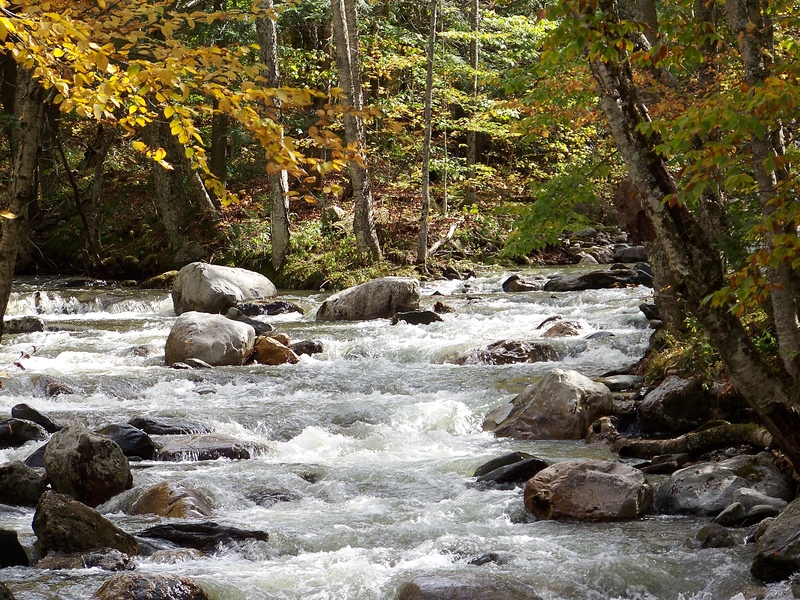 This small brook in the mountains became much wider and much faster after heavy rains overnight. 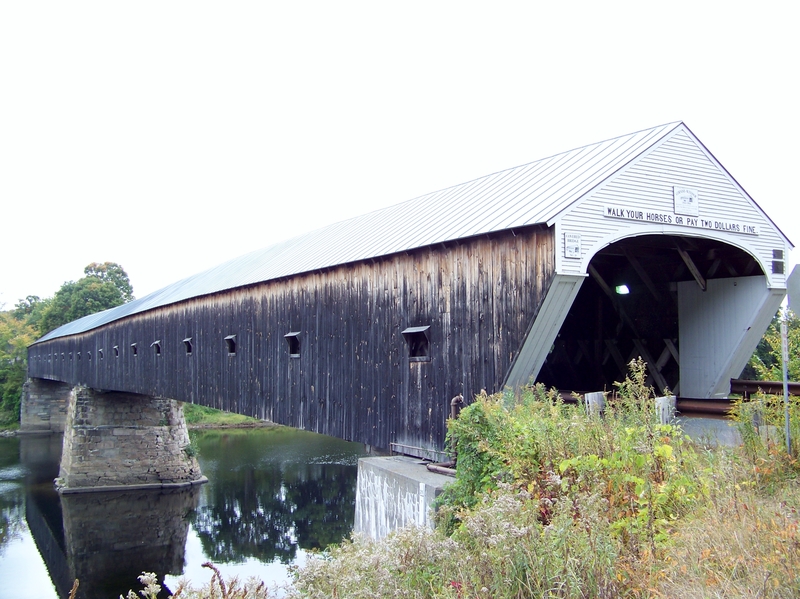 This covered bridge takes you from Vermont into New Hampshire, over the Connecticut River. The spectacular scenery never ended. We visited several historic sites while in Vermont. The golden dome of the Capitol was beautiful against the brilliant sky and fall leaves. 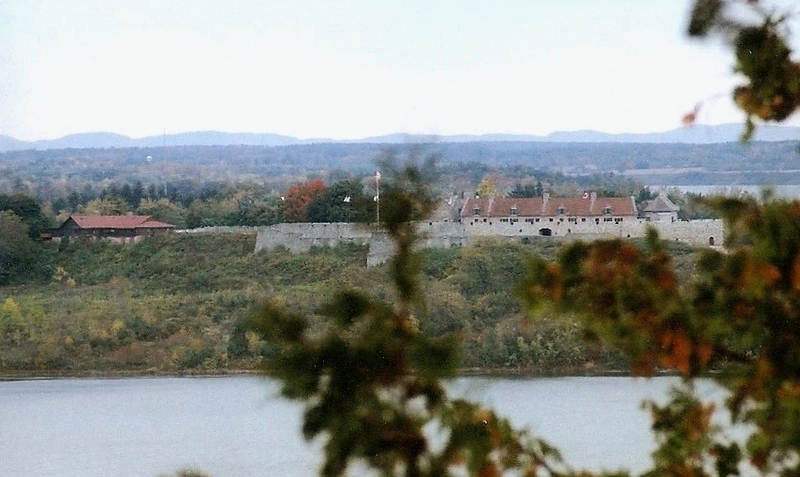 We traveled to the east side of the state to visit Mount Independence which sits on Lake Champlain, across from Fort Ticonderoga in New York. This historical site has a unique visitors center. Its displays explain what life was like for the 12,000 Revolutionary soldiers in the area who were there to defend against an attack from the north by the British. 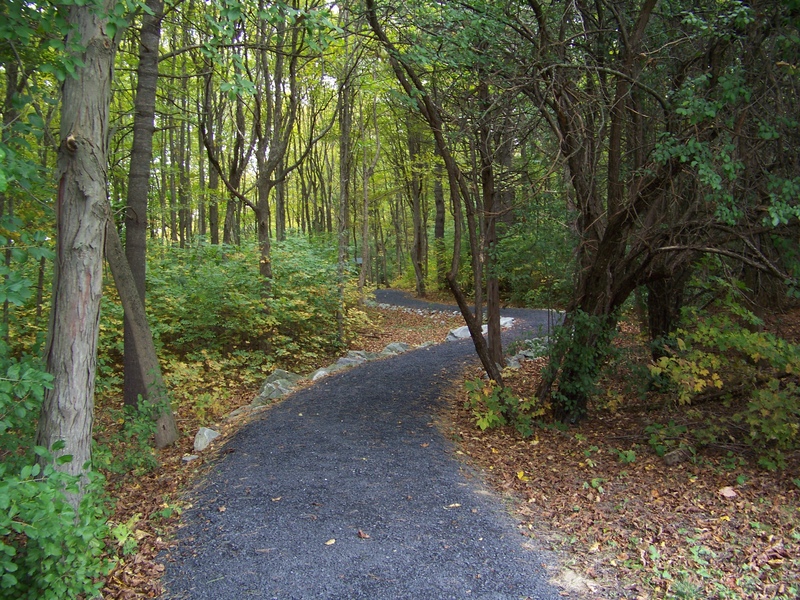 We walked two of several trails at Mount Independence, where you can still see well-preserved remains of the fort. A most interesting site was the Old Constitution House in Windsor. 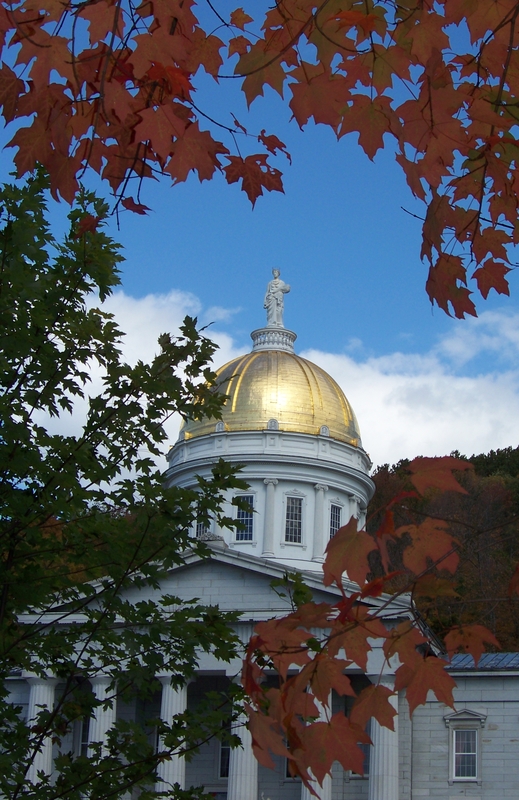 Did you know that Vermont was once an independent republic? Neither did we! 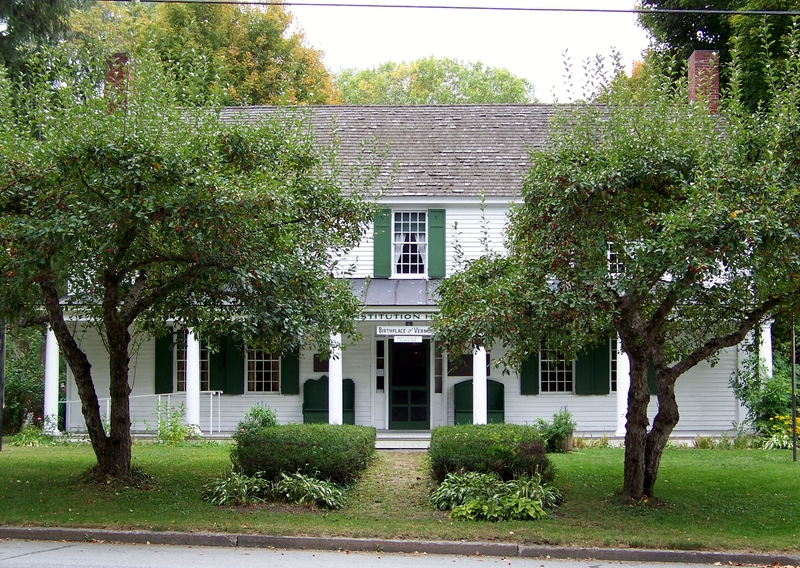 To avoid the conflicting land claims of the colonies of New Hampshire and New York, the people of Vermont decided to forge their own republic, and in 1777, wrote their own constitution at Elijah West’s Tavern in Windsor. 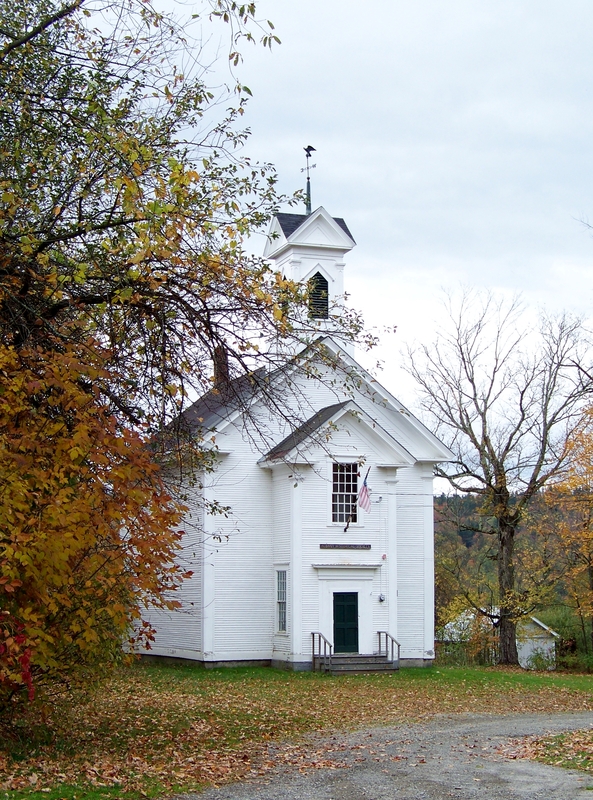 The Vermont Constitution outlawed slavery, instituted a public education system, established its own postal service, had its own coinage, Vermont coppers, and gave voting rights to all males living in Vermont. It remained in effect until Vermont became a state in 1791. This is the Old Constitution House in Windsor. Between May and mid-October, tours of the house are given by guides who take time also to explain the history of the Vermont Republic. Vermont is a beautiful and interesting place to visit any time of the year, but fall is indeed, particularly beautiful! This recipe is a great fall dish. It serves well as a vegetarian main course for dinner, but I like it best as a great lunch entree. It tastes really good with slices of fresh apple and good Vermont cheddar cheese. Enjoy! Wash the squash and cut them in half lengthwise. Scoop out the seeds and stringy portion with a spoon or ice cream scoop. Bake in a 400 degree oven, on a sheet that has been lightly buttered. It will take about 45 minutes for the squash to become fork tender. While the squash is baking, combine the chopped apple, concentrated cider, sugar and cranberries in a medium saucepan over medium heat. Bring to a simmer, reduce to low heat and cook for about 10 minutes, until the apples have softened. After removing squash from the oven, allow it to cool a little. Scoop out the tender squash pulp, but leave the shell intact. Mash the squash pulp with a fork, leaving it a little chunky. Season with salt and pepper to taste. 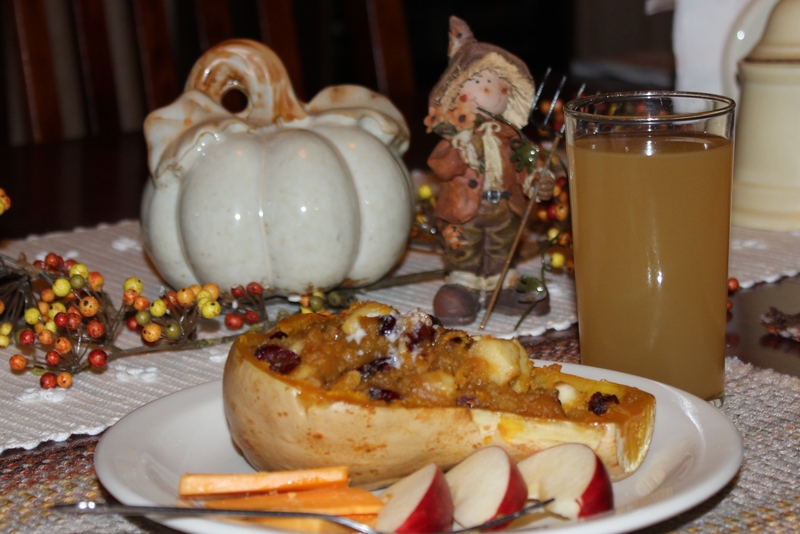 Combine the squash with the apple mixture. Fill each of the squash halves with equal amounts of the mixture and top each with a pat of butter. Return to the oven and bake for 5 more minutes. * To make the concentrated cider, you will need to boil 2 cups of cider until it is reduced to the 1/4 cup needed for this recipe. This recipe is adapted from a recipe I found in Dishing Up Vermont, by Tracey Medeiros, published by Storey Publishing in 2008.